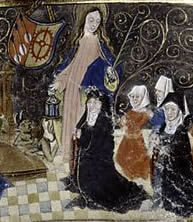 Above: St Gudula holding a lantern. Cropped image from a Gradual, 1494, Netherlands. New York Public Library, Manuscipts and Archives Division, MA092. In the public domain. A Gradual is a chant or hymn. The following comes from notes made by Mr. and Mrs Hatch circa 1990. Many thanks to Jeremy Hatch for the above document. William Crossing believed that the hexagonal base in St Lawrence Lane came from St Gudula's well. Gulwell. At Gulwell, near Ashburton, the shaft of a cross forms a seat by the roadside, and the upper portion acts as the support for a cider vat. The bottom of the shaft is square, and 11in in diameter. Two feet from the bottom the shaft is octagonal; four of the sides measure 5in and the remainder 4in across; the total length is 5ft 3in. The measure of the upper portion is 25in to bottom of arms; the arms are 10in in diameter, and the total length 44in. 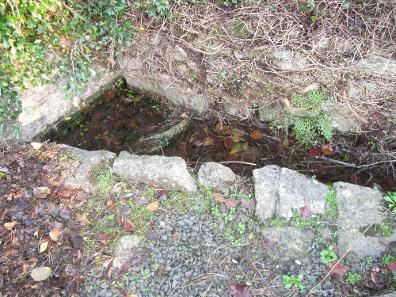 Near this place there is a holy well, the water of which is considered good for diseases of the eye. * According to http://www.catholic.org and other sources, St Lucy is the patron saint of the blind. St Gudula is known for a divinely lit lantern (when the Devil blew out her candle to divert her from her path), so there is the idea of darkness being dispelled. Above and below left: The cross and spring at St Gudula's well. [On Gulwell spring] 'We shall not find the cross here, but at a farm a little further on, and which bears the same name as the well. F H Starkey points out that some people claim that the well is that of St Gulwall, a 6th century Celtic holy man. 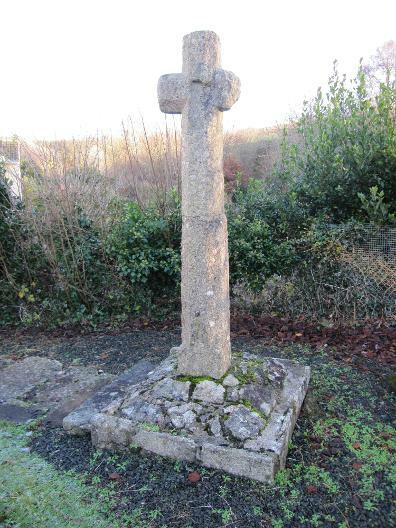 In 1933 the cross from St Gudula's well was retrieved from where it had lain 'for several generations' and was re-erected by unemployed men. There were plans to restore the well if there were sufficient funds. When planning permission was sought in connection with land next to Pear Tree Cross the Dartmoor National Park made a report on the area. They noted that the medieval farm of Gulwell, with 15th century origins, had been situated there, and a number of medieval and later pottery finds had been recovered. A marriage settlement in 1826 (between Monday and Bawden) concerns a house near the market cross.